Delicious crisp pieces of Broccoli coated in a layer of sharp Parmesan Cheese. It can only be one thing - Ketogenic Parmesan Roasted Broccoli! Cut the broccoli into evenly sized florets and place into a mixing bowl. 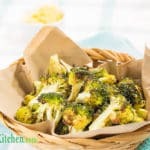 Add the oil, parmesan, salt and pepper and mix with your hands to ensure the broccoli is coated in the other ingredients. I recommend using food safe disposable gloves to keep your hands clean. Line a roasting tray with parchment paper and evenly spread the broccoli over the tray. Dab the butter over the broccoli. Roast in the oven for 20-25 minutes. For best result remove the broccoli after 10 minutes to mix through and turn. The broccoli is cooked when a knife is easily inserted into the thickest piece.